Don't let pain keep you from getting a good night’s sleep. 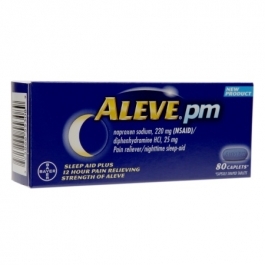 Aleve PM is the first and only over-the counter (OTC) PM product to combine a safe sleep aid with the 12-hour strength of Aleve, so you can fall asleep and stay asleep. Wake up well-rested and be a morning person again. Do not take more than directed. Drink a full glass of water with each dose. Adults and children 12 years and over: take 2 caplets at bedtime. Do not take more than 2 caplets in 24 hours. If taken with food, this product may take longer to work.